Rachael Balsaitis has been drawing pictures for her own stories since she could hold a crayon. She has illustrated several books, including Mama Loved to Worry and Annie’s Plaid Shirt. Rachael lives in Minneapolis, Minnesota, with her pet rats and a fern named Hendrix. Kimmy’s got gumption—not that she knows that. What Kimmy knows is that she wants to make her very own kite, even though everyone around her says she can’t do it. Kimmy cuts and pastes with paper and ribbons all morning long until at last, her creation is complete. But will it fly? And what will her friends think if it doesn’t? Despite any doubt, Kimmy sets her sights as high as the sky. 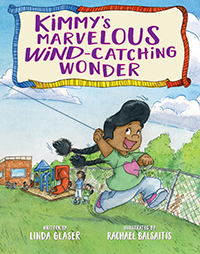 Use this book to help teach children to take risks and stand up for themselves.